The spectral signatures are generated using the bands presented by the image. It is defined as a response pattern that is characteristic since each material in nature has its own interaction with electromagnetic energy. The basis of a classification is to find some areas of the electromagnetic spectrum in which the nature of this interaction is different for the materials within the image. We understand by spectral signature as the reflectance as a function of the wavelength. The spectral signatures are used by classification algorithms that allow to label the pixels of the image. Different materials can have similar spectral signatures (construction, water, bare soils and vegetation cover). In the following image it is observed that each material has a unique signature, therefore, this spectral signature can be used for the classification of materials such as land cover, vegetation, water and asphalt / construction, depending on the resolution of the sensor, number and type of coverages that can be identified. Download free images (Landsat, Sentinel-2, Sentinel-3, ASTER and MODIS). There are several satellites with different characteristics that acquire multispectral images of the surface of the earth. 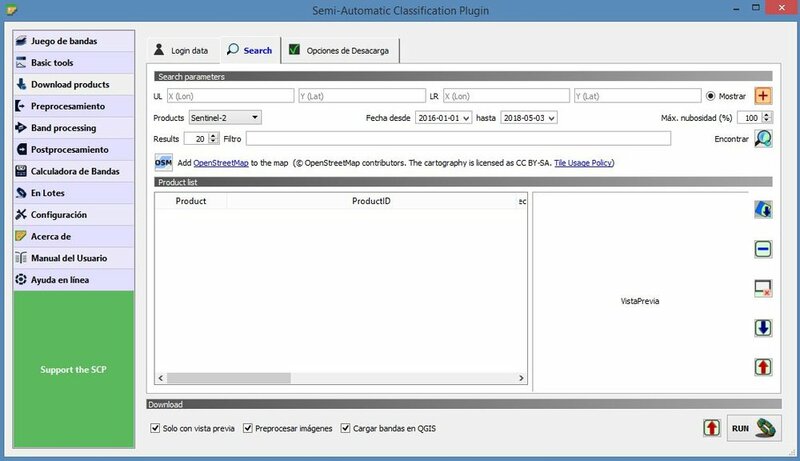 In this case, the Sentinel 2 images are particularly useful for the monitoring of land cover and can be provided free of charge from SCP. The spectral signatures (spectral characteristics) of the land cover classes are calculated taking into account the pixel values below each ROI. 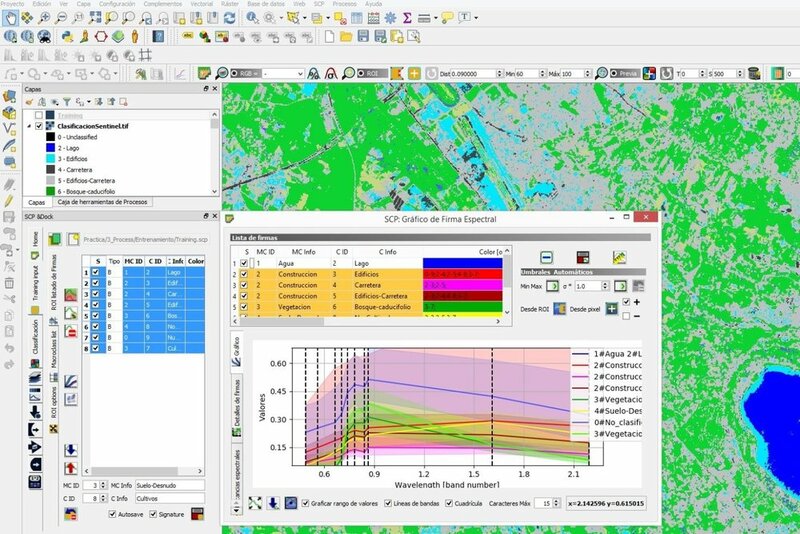 ROIs are polygons used for the definition of spectral signatures characteristic of land cover classes. The amount of reflected radiation with respect to the wavelength is observed, where the response of the spectral signature is reduced towards the infrared, this behavior is typical in lacustrine bodies since the increase in the depth of the bodies of water decreases the reflectance at any wavelength. In the case of vegetation, it is a resource that depends on many characteristics depending on the type of species to be evaluated (leaves, stems, trunk, humidity, etc. ), considering that this coverage is subject to different environmental changes. In this tutorial we are evaluating deciduous forest crops (trees), where the reflectance is low in the visible with an increase in the green color due to the presence of chlorophyll that is characteristic of the leaves. The reflectance increases in the near infrared due to the scarce absorption of energy by plants. 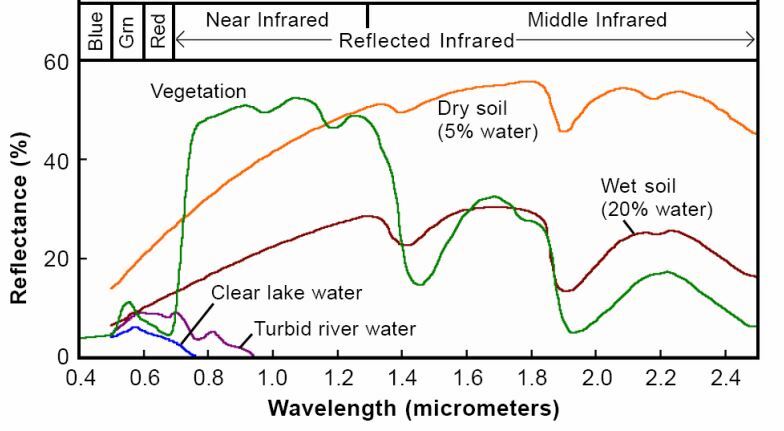 In the mid-infrared, there is a significant decrease along the wavelengths, since the water in the plant absorbs the energy. In the case of uncultivated (dry) soils, it is observed that the spectral signature presents a different behavior compared to the spectral signature of the crop coverage, the peak in the green color of the visible zone is no longer visible and there is a increase in reflectance along wavelengths since plants no longer absorb water. The spectral behavior depends on several characteristics such as air and water content, granulometric structure and texture. In this case, when dealing with construction covers such as buildings and roads, they are smooth surfaces that implies that the reflectance increases along the wavelength.